How did the site come to my attention? – I remember JustGiving launching its crowdfunding platform Yimby in 2013. The main goal behind Yimby was to “create a space where communities can raise money for social activism using technology to bring people together and fund projects at grassroots levels.” I then lost track of Yimby a bit, but I recently found out that Yimby has now been renamed as “JustGiving Crowdfunding”. My quick summary of the site (before using it) – I expect this site to be geared towards individuals or organisations that want to raise money for specific projects or communities, all with a ‘social’ or ‘community’ element. How does the site explain itself in the first minute? 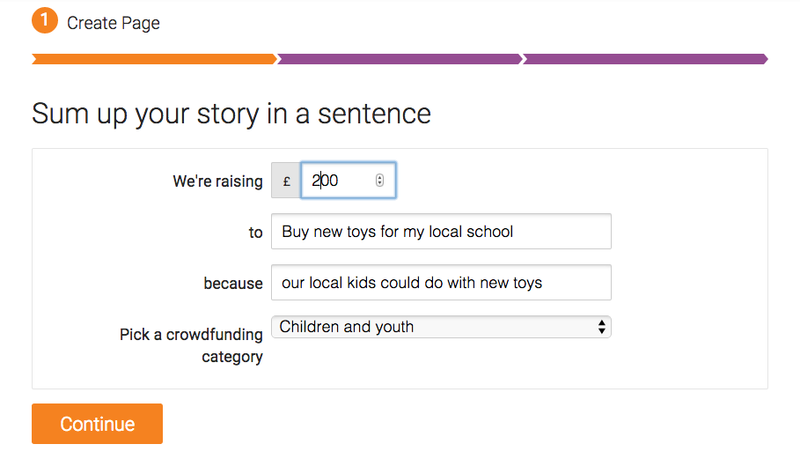 – “Raise money to make good things happen” reads the headline on the homepage of JustGiving Crowdfunding. The slogan is followed by this explanation: “With JustGiving Crowdfunding, anyone can raise money to fund their own project. If it benefits a friend in need, or a local or overseas community, JustGiving Crowdfunding can help you make it happen.” The visual explanations of the process and the benefits of doing this through JustGiving are helpful in understanding what JustGiving Crowdfunding is all about (see Fig. 1 and 2 below). Getting started, what’s the process like? (1) – At the bottom and the top of the JustGiving Crowdfunding homepage there’s an orange button which says “Raise money” (see Fig. 3 below). After clicking on this orange button I land on a page which is clearly marked as step 1 “Create Page”, followed by a “Sum up your story” tagline. However, when I look at what I think is meant as a progress bar at the top of this page, I’m unsure about the number and nature of subsequent steps involved. 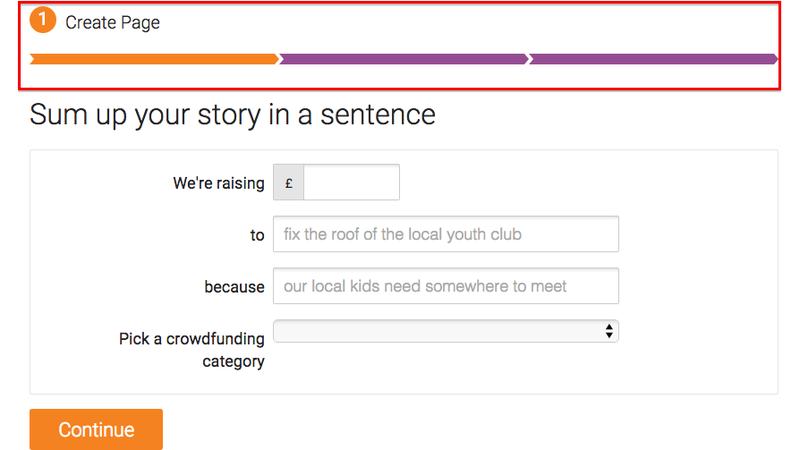 Assuming that a large proportion of people using JustGiving Crowdfunding will be doing so for the first time or won’t be raising funds online on a regular basis, I believe it would be helpful to the user if the progress bar included (a) the step the user is currently on – highlighted – and (b) subsequent steps involved in creating a page – with a progress number and brief description. Another suggestion would be to explain to the user why JustGiving uses a £200 fundraising target threshold. 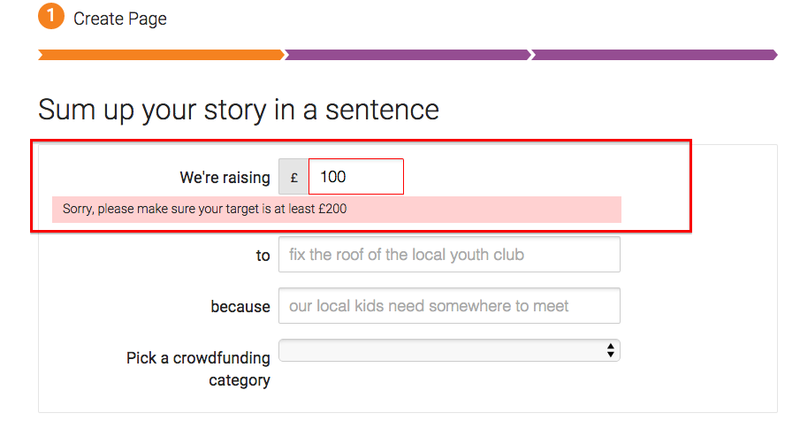 When I – unknowingly – entered £100 as my fundraising target, I got an error message which stated “Sorry, please make sure your target is at least £200” (see Fig. 5 below). As a user, it would be good to understand the rationale behind this threshold. Getting started, what’s the process like? (2) – Completing the “create page” step was very straightforward otherwise (see Fig. 6 below). When I click on “Continue” I then land on a page which looks very different and which asks me to log in or to sign up (see Fig. 7 below). This makes me wonder whether non-JustGiving users are likely to be thrown by this step or not. I can imagine that some users might be worried about committing to signing up without having a full understanding of the JustGiving Crowdfunding process and its outcomes. As I mentioned in my previous point, having a proper progress bar to outline the different steps would be helpful. Getting started, what’s the process like? 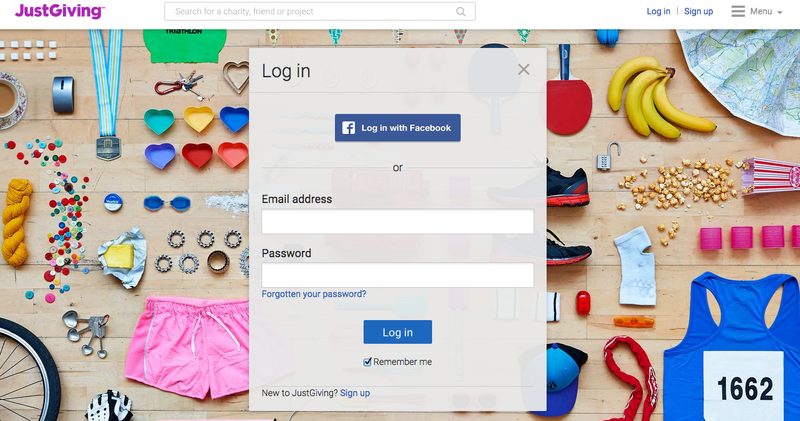 (3) – As an existing JustGiving user, logging in is very easy and swift. 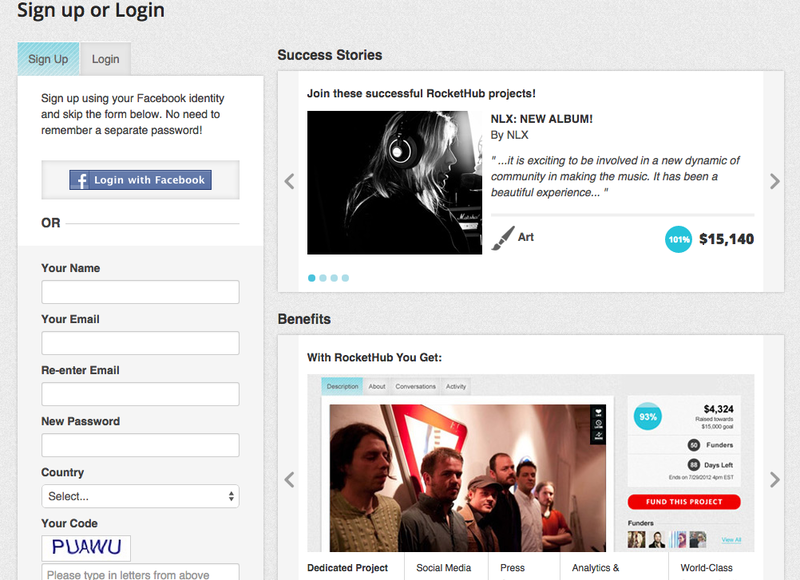 Once I’ve logged in, I land on an “Add the Details” page (see Fig. 8 below). 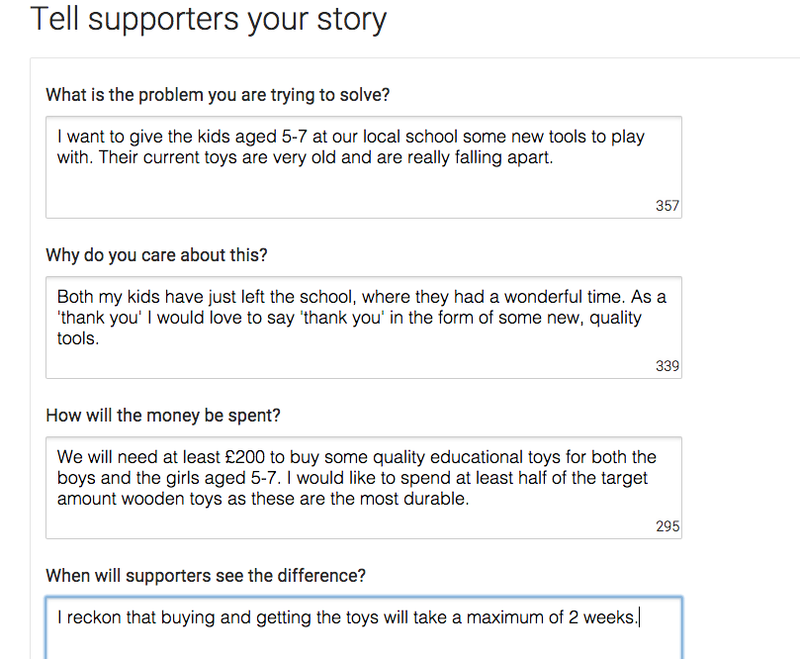 I took a fictitious example to be able to answer the questions in the “Tell supporters your story” (see Fig. 9 below) and it all felt very easy and intuitive. In the third and presumably final step I get to preview the page I’ve created (see Fig. 10 below). I found the information on the preview page very helpful, particularly the section about “Pledges and Updates”. The one bit of information and guidance that I and possibly other users would benefit from is about sharing/marketing your project and your JustGiving page. I would like to get some expert advice on how to make the most out of my JustGiving page and how to make sure that people get to see and read my page. How easy to use was the site? 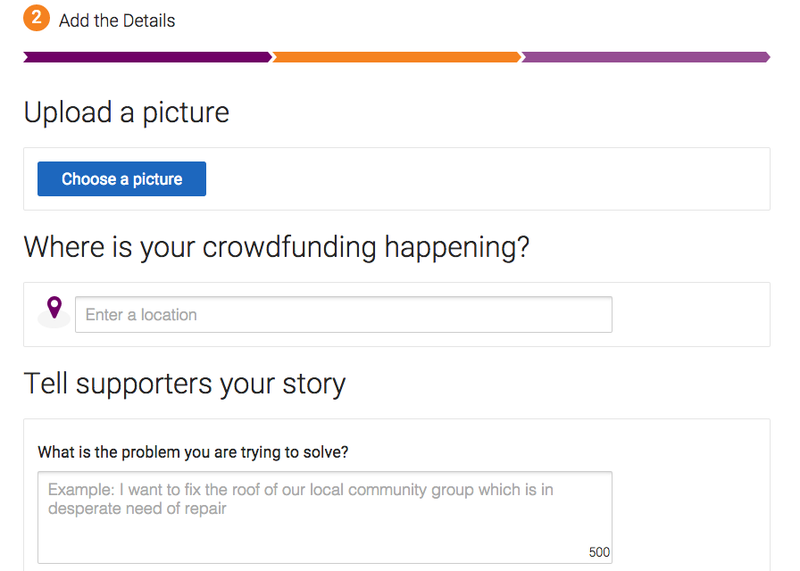 – The process involved in creating a crowdfunding page on JustGiving felt simple for the most part. As I mentioned in my previous points, I believe that the site can do better in guiding users through the page creation process, explaining the steps involved, their sequence and outcomes. How does the site compare to similar sites? 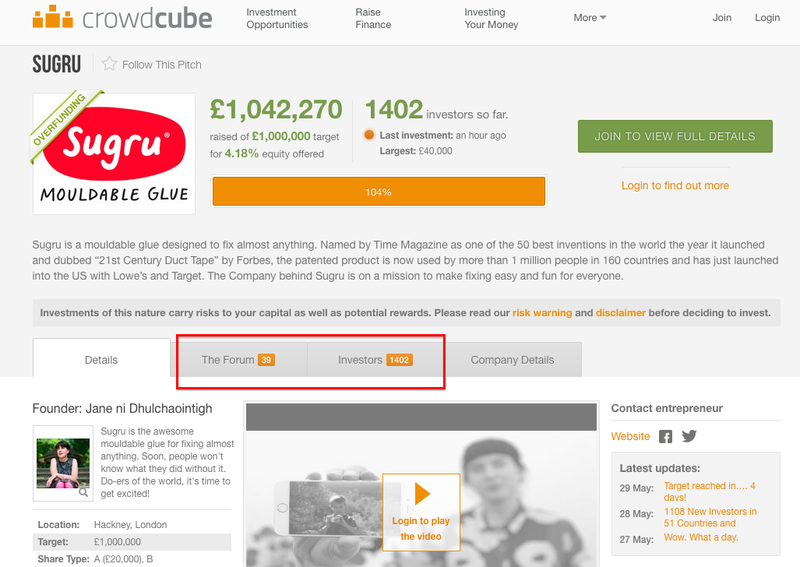 (1) – RocketHub is a large, direct competitor of JustGiving Crowdfunding. The fee that they charge the fundraiser will depend on whether the fundraising target has been met (4% if met, 8% if not). With RocketHub you get to keep the funds that have been pledged, even if you don’t meet your fundraising target (as long as you’re sure that you can fulfil your obligations). I really like how RocketHub provide users with guidance around benefits, their small print and success stories on their login/sign up page (see Fig. 12 below). GoFundMe is another good example, even though their platform is solely geared towards individuals raising funds. 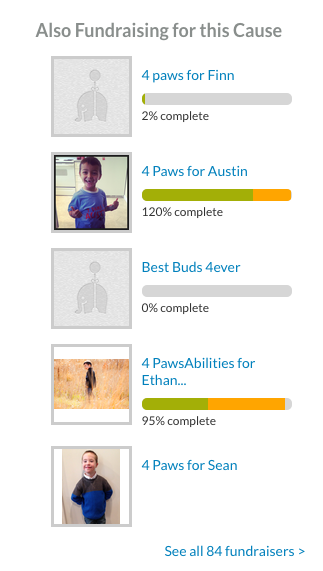 I like how they help their users discover charities or projects that they can give money to, e.g. by using Facebook’s “Funded by Friends” functionality (see Fig. 13 below). How does the site compare to similar sites? (2) – The experience on Razoo feels similar to JustGiving Crowdfunding, and is aimed at individuals and organisations which wish to raise funds for specific projects. I like the “Also Fundraising for this Cause” section which showcases other individuals or organisations raising funds for the same project. Buzzbnk is another good example of a competitor who focuses on “Positive people backing bright ideas”. Each Buzzbnk fundraising page has a nice, tabbed “About the project” section (see Fig. 14 below). The Buzzbnk site seems to focus more on ‘discovery’ than JustGiving Crowdfunding currently does. Did the site deliver on my expectations? 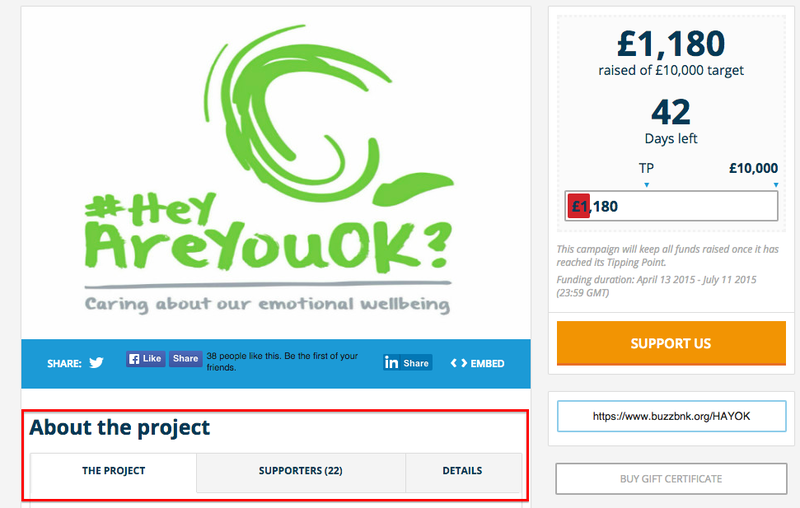 – Overall, the experience on JustGiving Crowdfunding feels simple and intuitive. However, I do feel that the site can do better in guiding people through the process, explaining exactly what needs to be done (and why) in order to raise funds for one’s social projects. For example, platforms like Kickstarter and RocketHub do this pretty well. Also, JustGiving Crowdfunding’s site feels a bit light with respect to two things. Firstly, the social aspect involved in raising funds for projects, really creating a community around certain projects – LinkedIn and Crowdcube (see Fig. 16 below) are doing this pretty successfully. Secondly, I believe thatJustGiving Crowdfunding can do more to encourage people to find and explore new projects or organisations to which one can pledge money. Buzzbnk are doing this well and there are other non competitive examples such as Meetup.com which is a great example of a business enabling discovery in a smart way. Thanks for doing a review of the site. Really useful to hear an external viewpoint on the product (I’m the PM for this). Funnily enough, I’ve just been reading the takeaways from our last round of user testing and a lot of similar themes emerged. And I’m glad that we’ve already got plans to look at most of the areas to improve that you noted – there’s a JIRA ticket for the step tracker changes going in the next sprint, and there’s a lot of work on discovery coming soon too.